The Rebel Sweetheart. : Pucker Up! | MUA Lip Boom in OMG and Cheeky. Last week, I did some much-needed spring cleaning with my train case. I segregated the old and nearly expired makeup from those that are still in good condition but I no longer use or grew tired of using. The latter I gave away to some of my mommy friends at school, while the former went straight to the garbage can. And with most of my old and unused makeup gone, I now have room for new ones! Simply put, my spring cleaning was an excuse to satisfy my lust for makeup and buy myself new ones (lol) - lip products, in particular. You know how much of a sucker I am when it comes to lippies. I can never get enough of them and can never have too much of them. Haha! Case in point, my latest haul from Updated Trends, which included two MUA Lip Booms. I was smitten just by looking at this photo, and was on the verge of purchasing all the colors. Created with English R&B artist Alexnadra Burke, the MUA Lip Boom is a lipstick and highlighting gloss that gives a dramatic illusion of volume to your lips, making them look fuller and more curvaceous. Now prior to this I've had no previous experience whatsoever with MUA Lip Booms, let alone any MUA product. So I had to restrain myself a bit and settled with just two colors, the ones that attracted me the most - OMG and Cheeky. Top: Cheeky / Bottom: OMG. I've been on the hunt for a nice coral lipstick since the year started, and coming across OMG, I felt like my prayer has been answered. MUA Lip Boom in OMG. OMG Lipstick and Lip Gloss. OMG is a pretty shade of coral, with a hint of pink to it. It has a very creamy texture, and gives a velvet matte finish. I like how it doesn't feel dry when worn, and how it does not settle on the lines in my lips. Color payoff is great, and staying power is pretty good, too. The color fades a bit after you eat - just a wee bit that needs very little retouching (or none at all) afterwards. As for the lip gloss, it comes in a matching color with tiny specks of gold glitter in it. Tiny enough that they go unnoticed when worn. Like the lipstick, the lip gloss has a distinct, sweet smell that reminds me a lot of toffee candy. It may smell overly sweet for some, but personally I like it. I also like how the gloss isn't sticky and feels light on the lips. Swatches. Lipstick on the left, lip gloss on the right. As for Cheeky, it's a cool toned, pale shade of pink. Think bubblegum pink ala Nicki Minaj. It has the same creamy texture and matte finish as OMG, and the color payoff and staying power is just as remarkable. Cheeky, however, is a tad easier to apply as it glides more smoothly on the lips. Well, on my lips, at least. MUA Lip Boom in Cheeky. To be honest, I wasn't sure if I would love this color in actual. I even had doubts if the lipstick will suit me as I was paying for it via the Multiply Shopping Cart. But hey, the color's pretty in the picture so it could be just as pretty in real life, I thought. And just in case it doesn't, at least I didn't pay too much of a price for something I might not like. The Lip Booms sell for Php 280 each - pretty affordable since you're getting two lip products for the price of one. Cheeky Lipstick and Lip Gloss. And as it turns out, Cheeky is just to my liking. In fact, I love it even more than OMG, haha! But I couldn't say the same for the lip gloss, though. Sure, it smells just as nice, and has the same lightweight, non-sticky feel as the OMG lip gloss, but Cheeky's is just packed with way too much shining shimmering splendid! The glitters are chunkier and more distinct than OMG's - like there's more glitter than gloss in that small bottle. Here's how the products look like on my lips. - You get two products for the price of one. - Velvet matte finish ala Chanel Rouge Allure Velvet lippies. - Great color payoff, good staying power. - Goodness gracious, all that glitter!!! And now for the Face of the Day... No, make that Faces of the Day, haha! FACE: Benefit Erase Paste in Medium, Nature Republic By Flower BB Cream in Natural Beige. Ever Bilena Original Eye Brow Pencil in Brown. 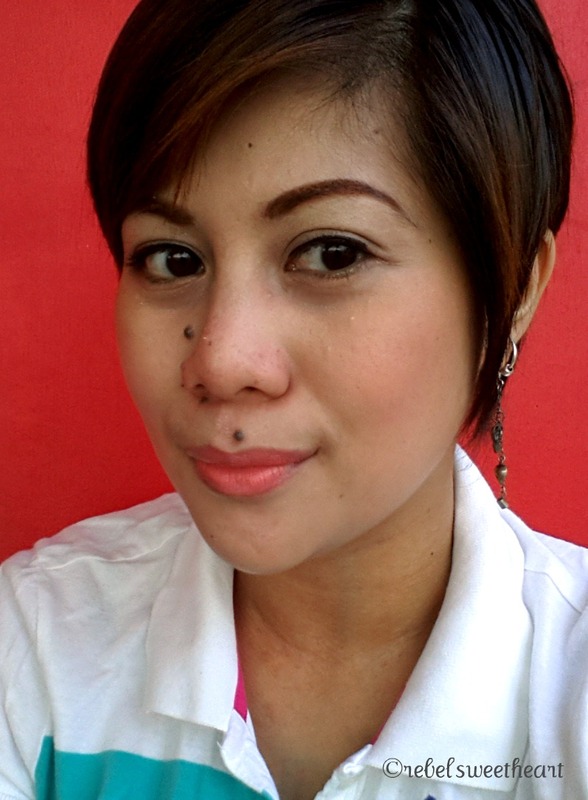 CHEEKS: Tony Moly Lip and Cheek Tint in Cherry Pink. LIPS: MUA Lip Bloom in OMG (left), MUA Lip Bloom in Cheeky (right). MUA Lip Boom and other Makeup Academy products are available at Updated Trends. Shop via their Multiply page, like them on Facebook, and get the latest product updates on Twitter! I do so admire women who can keep and use lots of makeup. I only had one stick of lipstick when I was an office worker and I couldn't even consume it before it expired. Haha. 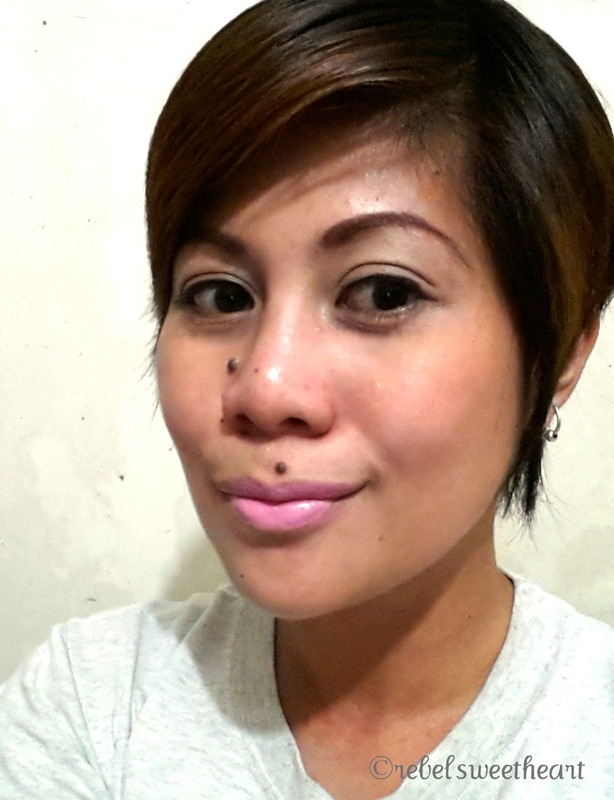 nice lipstick review u shared here. OMG I am so loving the shades... as in love love love them! ooh so lovely, i'm a lipstick addict too and i have been wanting to blog about it but don't have the time yet. will check this out. I think the orange-y lip color looks best on you :). I have to get myself some good lip stuff too. I love the bottom one, the cheeky lip gloss. Very subtle but the orange really suits you! Great colors! I need to clean out my old expired make up too! Thanks for the reminder. The Cheeky is so soft on you but they are both beautiful! I think the OMG Lipstick would look great on me. The Cheeky lip gloss looks great too.